Our new 2017 collection is as beautiful as it is functional. As the Shaker rule of thumb states, "Don't make something unless it is both necessary and useful; but if it is both necessary and useful, don't hesitate to make it beautiful." From statement storage to meaningful displays, take a look at a few pieces that embody all three. The perfect piece for storage can also make a beautiful statement. 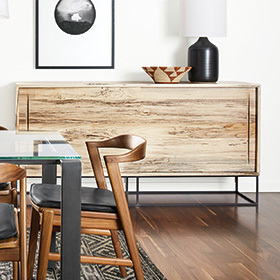 Our new Steen dining cabinet showcases natural wood grain as unique as the sugarberry tree from which it came. Lighting solution or glass art? It's hard to tell with our Banded pendants. Put your own mix on individual pendants or choose from our new Banded pendant sets. 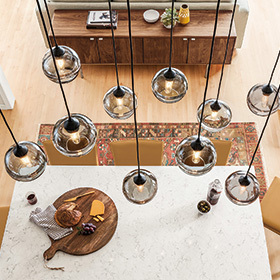 Each set includes a ceiling canopy to make a modern chandelier. Combining accessories reflects your unique point of view. 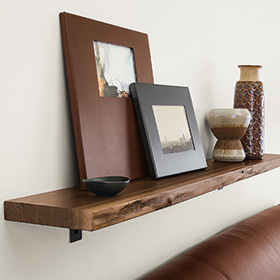 Our Stowe shelf has a live edge front that celebrates the tree from which it came. Each shelf is one of a kind and creates a unique focal point to showcase favorite photos and objects. Shop all shelves and ledges. That statement storage is GORGEOUS! I definitely need to invest in a piece soon. Right now, our things are everywhere – yikes!